Not Your Average Sandwich! - Episode 3: BACON!!!! Taking the BLT to New Heights! Hi, I like bacon! You like bacon! Let us rejoice in its joyous salty smoky porcine goodness! Everyone knows and loves the BLT: bacon, lettuce and tomato on toasted bread with mayo. But like all good things, with some love and effort, you can take a well-loved, but fairly mundane, standard and kick that sucker up to heights undreamed of! How?, you ask. Well, one way is by replacing boring old iceberg lettuce with something more snazzy, like arugula or red leaf. Or heck, omit the lettuce altogether and swap in some avocado! But if you really want to take it to a new level, make your own bacon. Yup, you heard me: Make. Your. Own. Bacon. It's craziness, I know, and it takes a fair bit of time. But wow, there's something beyond satisfying about taking something as ubiquitous and fantastic as bacon and making it all your own. So what is bacon exactly? Well, according to wikipedia, it's cured pork meat. What cut of meat and how it's cured varies around the world and even across the street. Your standard bacon in North America is made from pork belly, but other nations use the shoulder, loin, fatback, and so on. Our neighbours to the south often refer to a cut known as Canadian Bacon, which we call back bacon. It can be brined (or 'wet-cured') and it can be dry-cured. It can be used directly after curing (so-called 'fresh bacon') or it can be dried or boiled, but I think the best bacon is smoked to get that extra level of flavour. Some people even double smoke their bacon (cold-smoked for days at first, then hot-smoked for a few hours). But, I figured I'd keep it a little simpler than that. Now, my way of making bacon has two basic steps: curing and smoking. As I mentioned, you can skip the smoking step, but why would you want to??!?! So, let's get to it! First off, you need to pick up some pork belly. It's available at most butchers and supermarkets. How much you pick up depends on how much bacon you want to make. I noticed that, as opposed to store bought bacon, when frying up homemade bacon, it doesn't shrivel up as much. That might be because I cut my strips very thick, but I think it has something to do with the quality of the meat; I somehow doubt that the meat used in the giant bacon factory is as high quality as that which you get at the local butcher. All this to say that a little pork belly goes a fairly long way. I think I picked up maybe a little over a kilo or so (about 2 pounds), so that's the weight I'll use for proportions in this post. Once it was home, I cut the skin and a few millimetres of fat off the pork belly, cut the belly in half to make two square pieces, and placed them in a non-reactive dish. A glass-pyrex lasagna pan works well. Next, it's time to make the cure. I happen to be lucky enough to have Sriricha Salt on hand (that Kari made from the Sriracha Cookbook by Randy Clemens), so I used a bit of that, but it's by no means necessary. Then again, I could use this opportunity to reprint Mr. Clemens' recipe for you so you can use it yourselves! - In a bowl, mix salt and Sriracha. Spread out mixture thinly over baking sheet and allow it to dry uncovered for about a day or two, stirring once or twice. - Store in an airtight container for future use. And there you go! So now let's get to our cure! Mix all the ingredients in a bowl, but only add the maple syrup if you're going to be curing your pork belly right away. If you're not planning on curing the meat right away, put the mix of the other ingredients in some kind of sealable container or plastic bag until you're ready to use it. If, like me, you got an instant hankerin' to get that piggy goodness a-curing, you'll get to it right away. Take the bacon cure and apply it liberally to all sides of the pork belly, pressing it into the meat. You want to get a crust of cure on all sides of the meat. It's going to be sitting around for a while in this cure, so you need a good layer. Once you've applied the cure, wrap the meat in plastic wrap and put it in the fridge in some sort of bowl or pan that can collect any moisture that will leak out of the meat, because it will, and that's all part of the process. Leave the pork belly in the cure for anywhere from 4 to 7 days. During this time, the salt and sugar will be absorbed into the meat, causing it to dry out and contract a little bit. You'll see this happen within a couple of days. You can reapply more cure if you like, but I found it unnecessary to do so. As I said before, there will also be some liquid collecting at the bottom of the container. Leave it there, or you can rub it back into the meat (that sounds messy though, since the liquid is mostly maple syrup). Either way, it'll get reabsorbed and keep adding flavour to the meat. When you're ready to get the meat on the smoker, take it out of the fridge and let it sit out for an hour or two to warm up a little, it helps the smoking process. Now, should timing issues arise, as they did with me, you might not have time to smoke the meat after 7 days. I suggest you freeze the cured meat in a ziploc-style bag. Once you're ready to smoke it, let it thaw out overnight in the fridge. It'll be ready to go, but when you remove it from the bag, pat it dry with paper towel. You don't want any moisture on the meat before it goes in the smoker. And now, let's smoke our bacon! So, we've talked at length about smoking on this blog, so check the link for this post to get the detailed basics. 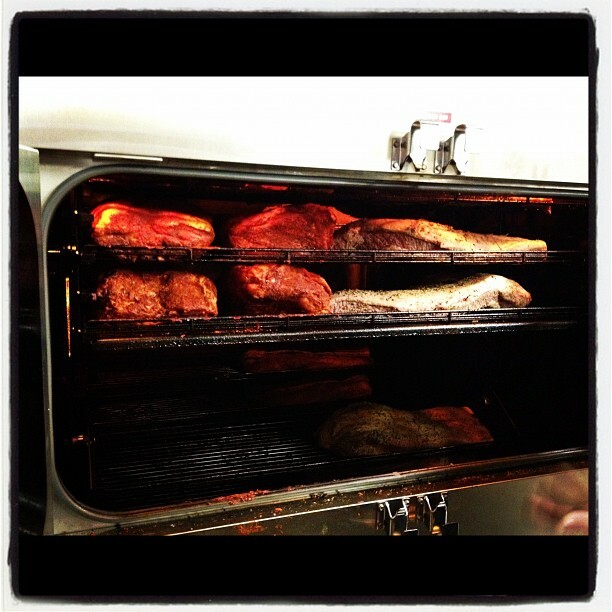 In this case, the desired smoking conditions are 225 to 250 Fahrenheit for about 4 hours for 2 pounds. The more meat you smoke, the longer it'll take. As usual, I use lump maple charcoal to build the fire. For smoke, I used a handful of apple wood chips, soaked in water for about 30 minutes (hence, apple-wood smoked bacon!). As you smoke the bacon, rotate each piece every 30 minutes or so to ensure even smoking on all sides. Because the bacon is already cured, there's nothing that needs to be added while it smokes. Once you've smoked it for 4 hours, it's ready to go. Remove it from the smoker and let it rest for 30 minutes before slicing. You can slice the bacon however you want. I like thick slices of bacon, so I just used a kitchen knife and sliced about 3 millimetres thick. If you prefer your bacon to be the same thickness as what you get at the supermarket, you're going to need a deli slicer, or surgical precision with a knife. Now, this is a post about making sandwiches, so we should maybe get on that! The regular BLT is a pretty damn tasty sandwich in its right, but I find ordinary iceberg lettuce utterly boring, except maybe on a hamburger. So, I picked up a box of mixed greens (red leaf lettuce, spinach and other greens) and decided that instead of using the greens in the salad, I'd have them on the side with a tasty little dressing. So, what the heck should replace the lettuce? Hmmmm, well, avocado's green, that'll do as a replacement (it's also really freaking delicious!). And with that, we have the BAT! - Fry up bacon slices in a skillet to desired doneness. Thicker-cut bacon can be cooked until very crispy (even a little burnt) on the outside while still being tender on the inside, so it's pretty hard to overdo it. Set done bacon on paper towels to drain. - Spread mayo and pepper on bread and layer bacon, tomato and avocado. Slice sandwich in half and serve with salad. - Whisk all ingredients together and toss over greens. While I may be about a month late, I figured it would be fun to relate this year's Valentine's Day dinner extravaganza in a blog post. Better late than never! I basically put this together off the top of my head, with a few bits of inspiration coming to me here and there, in the week leading up to V-Day. For example, for the dessert course, the use of pineapple was based mainly on the fact that it was on sale at my local supermarket. So, let's just get into it and see how it goes! It must be noted that this is a meal that might require you to take the day off work, or at least cut out a few hours early! I guess it depends on your sweetie's schedule. I had the benefit of having the day off and my love, Kari, working till about 6 pm. It should also be noted that I made all three courses basically in one fell swoop instead of cooking then eating one course at a time. An oven on 200 Fahrenheit keeps food warm without cooking it further, as long as you don't leave the food in for very long: 15 minutes is fine, an hour might be a bit much. Now, before we get into the preparation portion of the evening, let's assume that all these recipes serve 2 people. - Mix well with hands and rub into meat. Seal in a large plastic bag and let sit in fridge overnight. Remove from fridge and pat dry with paper towel. Allow meat to sit out for about an hour to air dry. - Smoke at 220-230 F for about 2 hours using lump maple charcoal and pecan wood chips. - Once the pork belly has been smoked, take half and cut into small cubes. - Fry until crispy and set aside on paper towels. - 6 Kalamata olives and 4 brined green Sicilian olives (they should be a darker green than Manzanilla, firm and come with the pit still in them), pitted and roughly minced. - Mix all ingredients in a side serving dish and set aside. - In a skillet, melt butter until nearly browning. - Place scallops on a bed of arugula and top with pork belly and olive relish. ﻿﻿You can also add toasted pecans for some extra flavour and crunch. This dish should be paired with a nice New Zealand Sauvignon Blanc or a dry Pinot Grigio. It turned out to be a really tasty appetizer (hell, it could have been an entire meal in itself!). The flavours complimented each other nicely, but I credit the ingredients for that. I just wish I'd remembered the bed of arugula, it would have added a lovely crispness and liveliness to the dish, but its omission didn't really take anything away. There's something about a good piece of beef grilled rare/medium rare that speaks to the sensual nature of Valentine's Day. It's rich, luscious and juicy, especially when it's a very tender cut. I lucked out when shopping for the meat because the butcher (Saslove's) had the tail ends of a beef tenderloin (which is the same cut used for filet mignon) for a very good price. I figured since it was V-Day, I had to go the decadent route with this bad boy. So, after having figured out how to make brown butter not too long ago, I thought a mix of that and truffle oil would be a good way to top the beef. As I made the sauce, I noticed that it lacked body, so why not add some blue cheese? I wanted to keep the sides fairly simple, so I went with roasted potatoes (albeit purple) and carrots. Now, it's me, so the potatoes had to be topped with smoked blue cheese and the carrots had to be glazed with maple syrup, ginger and a bit of lime juice. In order to help with your time management, I'll be going in order of preparation. - Preheat oven to 350 Farenheit. - Toss potatoes in a bowl with olive oil, salt, pepper and herbs. - Line an oven-safe dish with aluminium foil and spread potatoes out. - Roast potatoes until they can be easily pierced by a fork or toothpick (20 minutes, give or take). - Remove from oven, slice in half and crumble smoked blue cheese over top. - Put back in oven until cheese is melted. Reduce heat to 200 F to keep warm. - Set a pot of salted water to boil. - Once water is boiling, add carrots and boil to desired softness (10-15 minutes). - Drain carrots in a strainer. - In pot, melt butter and sauté ginger for about 2-3 minutes. - Return carrots to pot and stir in maple syrup and lime. - Remove from heat and move to oven to keep warm. - Prepare fire in grill and get very hot (350 degrees or more). Sear meat for about 5 minutes on each side, getting to rare/medium rare. - Tent in foil to rest for 10 minutes. Move to oven at 200 degrees to keep warm if necessary. - Melt butter on high heat and cook until it foams and browns. - Stir in truffle oil and cheese, stir until cheese has melted. ﻿﻿The result? Quite good I'd say! The beef was perfectly cooked (something I've never been the best at), the sauce was luxurious (luckily I didn't use too much of it), the potatoes were also really tasty. I found the carrots had a bit of a medicinal undertone, but Kari liked 'em! As I've said before, dessert isn't really my forté. I usually avoid making them altogether, but it was V-Day and I had to go above and beyond. Luckily the inspiration for this came pretty easily. We had a gorgeous meal at Play on New Year's Eve and the dessert was a Pineapple Meringue Pie (of sorts) with a Rum Caramel. Well, I didn't have the time or inclination to make a pie crust, but I figured some grilled pineapple would work well, especially if it was swimming in my own rum caramel! So, I picked up a little bottle of the 'good stuff' (Appleton Estate Rum) and made it happen. It helps that the recipe is ridiculously easy! - Place on hot grill and grill for about 6-7 minutes a side, until soft but not mush. - Melt butter in a saucepan. Stir in brown sugar; keep stirring until melted. - Add rum, vanilla and cinnamon. - Cook sauce for another 3-4 minutes and spoon over grilled pineapple. I paired this one with one of Kari's favourite drinks: Ice Cider. It's not well known outside of Quebec, we had only first tried it at this year's Wine and Food Show, but Kari was insta-hooked. I actually liked it too! And I HATE the cider you get in bars (e.g. Strongbow). BLECH! But Ice Cider tastes almost like an apple syrup. It's very sweet, but the acidity and tartness of the apple cut through it beautifully, unlike the more well-known Icewines of Ontario which I find achingly cloying. Dessert - Grilled Pineapple with Rum Caramel; Ice Cider on the side! This one was a pretty big hit for the Rum Caramel; the pineapple not as much (I undercooked it)... But yeah, I'm thinking Rum Caramel on good vanilla ice cream will be a popular dessert in Casa del Unicorn this Summer! So there it is! A pretty successful Valentine's Day feast! What did you all make your sweeties? I'd love to hear what you have to say! I've declared it many, many times but I'll reiterate: I LOOOOOOOOOVE Barbecue. And I don't mean grilling a steak over charcoal, because that isn't real Barbecue. Real Barbecue involves cooking meat with indirect heat and smoke. As I've already mentioned a bunch of times (mainly in January 2011 with these two posts), I enjoy smoking/BBQing tremendously. But I'll be the first one to tell you that I'm not nearly as good at it as I should be - I still struggle with getting the tenderness and moisture levels right in my food. So, it's no surprise that I am always on the lookout for tasty slow-cooked smoky goodness whenever it comes to town. 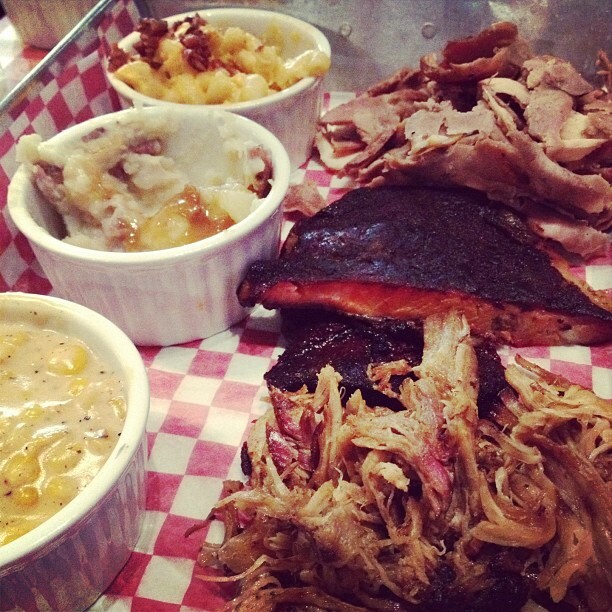 But Ottawa isn't exactly what you'd call a Barbecue mecca. At least it wasn't until some new culinary establishments hit town over the past year or so. The first of these was The Smoque Shack, which opened in August of 2011 on York Street, just past the corner of Dalhousie in the former digs of Caveau Szechuan. It was a bit of a revelation of tasty goodness, but I'll get more into that later. In November, Fatboys Southern Smokehouse opened up a few blocks away on Murray Street. Finally, in January 2012, the Mill Street Brew Pub opened up near the War Museum. In this post I'll be looking at all three establishments, but I'll be giving a special look at Mill Street in a future post, it deserves a fair bit of special attention for more than its BBQ offerings. So in this post, I'll just be focusing on Smoque Shack and Fatboys. There was a lot of excitement for both Kari and me heading into our first trip to Smoque Shack since it was the first time Ottawa had a proper Barbecue joint, or so we hoped. I figure it was around October, about a month or two after it had opened and we were hearing good things. It helped that Kari knew one of the owners, Warren, from his stint as Executive Chef at the now-defunct Sweetgrass. We entered where we first saw the bar, it was a nice relaxed set-up, probably good for a quick lunch drink and nosh. They sat us in the back of the house where the majority of tables are located. The ambiance and atmosphere was a good mix of casual sports bar and slightly trendy. The clientele ran the gamut of hordes of university kids getting ready for a night out, first dates and 3-generational tables; no one really seemed out of place. Next came the menu, and what a menu it was! So many selections! And to my surprise, not only is Smoque Shack all about the BBQ, Warren also played up his Jamaican background by adding Jerk Pork and Jerk Chicken to the offerings. The menu is set up in (what I guess is) the traditional BBQ/Soul Food way where you get your meat and add sides as you choose for whatever their cost. Example: You can get a half pound of Pulled Pork for 8 bucks, then add sides like Mac n' Cheese for $3.50 or Sweet Potato Fries for $5. So, it allows for satisfying a simple meat craving, or having a full-bore pigout. All depends on hunger and budget. Now, what first grabbed our attention was an entry from the "Snack and Grazing" menu: Rib Tips. "Marinated and fried up crisp, served dusted in our special seasoning or tossed in one of our signature sauces: Hot, Pirri Pirri, Sweet Chili, Memphis Red Sauce, BBQ, Jerk Sauce". Yeah, this had to be in my mouth... So, as our server came back to take our order, we asked what sauce would be best and he suggested we stick with the simple BBQ. Thank you Mr. Server for that! It was soooo good! I seriously have to talk myself out of ordering the Rib Tips every time I go just for the sake of trying all the other tasty items on the menu! Imagine little nuggets of rib meat with just a bit of crunch from deep frying. They're not the same texture as actual smoked ribs (they're a bit tougher, but not in an unpleasant way), I guess you could say they're a porcine version of chicken wings. Regardless, should you ever go to Smoque Shack, I cannot recommend these enough to you. EAT THEM!!!!!! Rib Tips, must eat, soooo goood!!! Now, since then, I've had all kinds of different goodies from Smoque Shack. I've had their brisket, which was heavenly (coffee-based BBQ sauce? Yes please!). I've had the Jerk Pork, which was perhaps a little tamer than the true authentic melt-your-face Jerk that a few friends of Caribbean descent have made for me in the past, but still delicious. Also had their chicken and pulled pork, both super-tasty as well. Oddly enough, I haven't yet tried the pork or beef ribs. Maybe due to cost, maybe because I just wasn't in a rib eating mood. Or maybe just because the goddamn Rib Tips keep calling me back... Either way, I will try their ribs next time I go and give y'all an update or comment. A special note on their burger. I know, I know; getting a burger at a BBQ place seems a bit pointless. But to be honest, it was one of the best burgers I've ever had. There was a touch of chili powder in the meat and the patty was super-thick, but properly cooked and juicy (I don't care what anyone says about a 'rare' burger, pink in the middle of a burger is NOT a good thing!). Definitely something to try if you're in the mood for a burger. And of course it has bacon! The sides are also pretty good, but there are some hits and some misses. Their Greens are really tasty, as they use a variety of greens (kale, chard, etc. ), not just collard greens. They cook them with bacon and there's tremendous flavour, but I still prefer the old school preparation with smoked pork hock that they serve at Jean Alberts. Other sides worth trying are the Mac n' Cheese (more bacon!) and Sweet Potato Fries (always perfectly crispy and really well seasoned). So, that's Smoque Shack. Next, Fatboys. The anticipation for Fatboys opening was only a bit less keen than that for Smoque Shack. It's located on Murray Street just east of Sussex, right next to the building where Kari works (and I used to work for ten years, so familiar territory!). We went right after it opened, I believe its second week of business in December of last year. The interior is quite the marvel. It's a huge, almost warehouse-like location (which was a shock considering how small the space looks on the outside) with a grand open-concept kitchen. Where Smoque Shack has a cozy intimate feel, Fatboys is a bustling hive of activity. We met the owner who told us that the concept was to be as authentically Southern U.S. as possible, for good or ill.
"I don't know what a microbrew is." Aaaaaaaand facepalm. Now, I understand wanting to keep an authentic experience, but you should also know your potential clientele. This is Ottawa, not Florida, and no matter how authentic an experience you wish to give your customers, GIVE THEM THE BEST BEER POSSIBLE! We don't screw around in this town when it comes to our brewskis! (except maybe the idiot hipsters who have convinced themselves that Pabst Blue Ribbon is drinkable). Anyway, with the disappointment accepted, I instead got a bottle of Busch beer (as in half of the Anheuser-Busch brewing company, the ones responsible for/guilty of brewing Budweiser). For a mass produced American beer, it actually wasn't too bad, but it sure as hell wasn't a Vanilla Porter or Steam Whistle! So with this annoying, but not ruinous, strike against the experience, I was offered a bit of a tour of the facilities (the bonuses in a subtle mention of "I write a food blog" can be pretty damn cool at times!). We were shown the smoker up close and it was one hell of a contraption! Beats the hell out of my little amateur barrel smoker! Also met the "Pit Boss" and he seemed to know what he was doing - I was getting excited to try out what he was throwing down! ﻿So, back at our tables, we figured it was time to get on with the whole "shoving smokey meaty goodness in our mouths" portion of the evening. Between the two of us, we thought it would be best if we shared The Kentucky Trio, which is a 1/4 lb. each of three different kinds of meat with three sides. After some debate, we decided on Pulled Pork, Memphis Pork Ribs (so dry-rubbed with sauce on the side) and Smoked Turkey (I've never had it nor seen it in a resto before). For sides we had Smashed Potatoes with gravy, Creamed Corn and Mac n' Cheese. Now, none of the meats came sauced, which is fine since they have squeeze bottles of a BBQ sauce, a spicy sauce and a mustard-based sauce. They were all pretty tasty, especially the spicy, but nothing that made me gasp in pleasure or feel jealous. As for the meat, well, it was kinda disappointing. The Ribs were a bit tough and they had no flavour on their own. I understand Memphis-style ribs don't come with sauce on them, but that's when you need to ROCK the rub and this rub tasted of mundane paprika and that's about it. The same applied to the Pulled Pork, also under-rubbed and bland. I wish I could say the sauces saved either, but they didn't really marry well. We tried the sides and they too weren't remarkable: the Creamed Corn tasted fake-ish, as did the Mac n' Cheese, but the gravy on the Smashed Potatoes was really good. What saved the meal, thankfully, was the Smoked Turkey. It wasn't super moist in and of itself, but tender and DELICIOUS! Especially when smothered in a metric ton of gravy. I would go back just to eat lots and lots of it and slip into a happy tryptophan coma. But unfortunately, that's about all I'd go back for, although they do have live Rockabilly acts now and then, so that might be worth another trip. Happy snarfing of smoke-kissed carcasses of joy!